Permanent Temporary | A humorous and insightful study of modern American society. 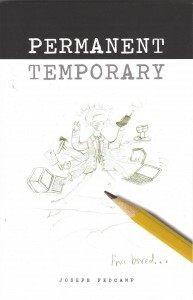 Permanent Temporary is a humorous exploration and adventure through the temporary employment world. Over a 10-year period, Joe Fedcamp had over 70 jobs, assignments or projects in many different industries, but not because he was lazy or stupid, but because he was bored and seeking excitement and flexibility, and realized he could learn a great deal along the way. Employment websites, particularly Craigslist.org, opened up a whole new world of opportunities to the independent and freelance workforce. Joe took full advantage (while still being ethical). He wrote this book to share what he learned and to give you a peek into his hilarious adventures. Joe lived in Ohio, The San Francisco Bay Area, and New York City. His travels took him to the 4 corners of the country, literally, (including Hawaii and Puerto Rico! :)), as well as Mexico, Canada, England, Costa Rica, Paris, Greece, Amsterdam, Scotland, and Barcelona. His journey landed him everywhere from renowned rock clubs to the New York Stock Exchange. He was involved with NBC’s hit series, The Apprentice, and he also photocopied the financial papers for the infamous Enron investigation. And of course, he waited a few tables. In addition to being a writer, Joe is a business and marketing nerd, and a closet comedian. A good portion of the book is an investigation of different business environments and strategies. A larger portion is jokes about them. Enjoy. 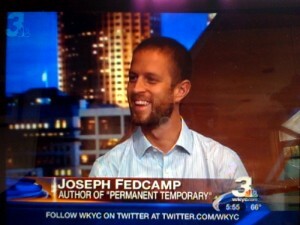 Permanent Temporary is available at Amazon and Barnes and Noble. Or go to Amazon or bn.com and search “Fedcamp”!! You can also read the first few chapters on Google Books. Or send us an email and we’ll send you a FREE PDF of the ENTIRE BOOK! No Joke.